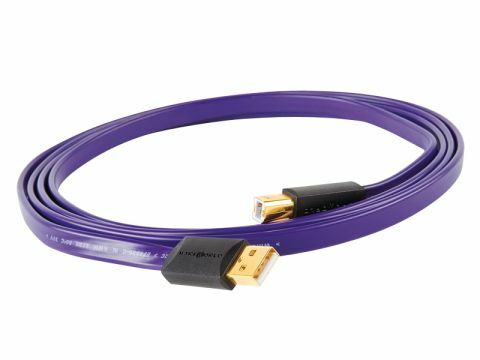 Like Kimber, Wireworld has embraced the concept of USB cables and offers both the Ultraviolet 5/2 and the dearer Starlight model in a variety of lengths up to seven metres, and with a choice of Type B or Mini B connectors. The obvious difference from every other USB cable we've seen is that this one is flat in cross-section, which Wireworld suggests both improves performance and makes the cable easier to handle and route. We'll find out about the first claim in a moment, while the second rather depends on what one is comparing it with. We found this cable a little unwilling to lie where we wanted it, but it mates well at both ends and didn't seem to mind a little rough handling. It combines silver-plated copper conductors with connectors that are both gold-plated. As with the other cables in this group, Ultraviolet clearly made some differences to sound when compared with giveaway cables, but it does seem to have a distinct character of its own. Specifically, it has a tonal quality that distinguishes it from the others. It has a slight prominence in the upper bass that does no harm at all to rhythmic qualities, but sometimes makes familiar instruments and voices sound a little more bassy than one is used to. At the same time, and probably as a side-effect of that, the treble is a little mellower than usual. Still, this all means that the bass is decidedly confident overall, forceful even, and as a result this is a great cable for rock and other bass-rich styles.